The alarm has me up at 04:00 (BST) and checking weather forecasts, still looking acceptable for setting off with a F5 WSW although meaning more motor-sailing. I notice I have a text message from Marion timed at 03:30 (BST) saying she will delay her departure by a further day to get the boat and herself better prepared after the trying trip yesterday, sensible call. Breakfast done I go on deck to prepare Hyrst for departure and notice there is no activity on Alice Pellow so walk on down to find all in silence. A good knock on the hull has a drowsy Dave appear muttering about time zones and alarm clocks whilst encouraging Cory to get moving. We are both away from the marina for 05:00 (BST) into the dark, encountering a couple of fishing boats returning into the harbour but otherwise quiet. I manage to sail with both foresails and double reefed main for a while but the wind is heading me off course so I revert to mainsail only after less than an hour. There is a significant choppy swell running and I can see Alice Pellow showing a lot of underwater area as she works the waves. Hyrst is similarly pitching around but keeping way on under engine power.The tide is with us until 11:00 (BST) and I am off Calais Approach buoy for 09:30 (BST) and at the edge of the northbound TSS lane by 11:00 (BST). The change of heading to cross the TSS does not give sufficient wind angle to sail to so I continue motor-sailing, with the wind speed dropping away as I get closer to the English coast. Crossing the shipping lanes only throws up one incident with a northbound bulk carrier making a course change showing that it will pass astern of me then soon after changing course to pass close ahead of me, too close for comfort according to my AIS CPA and by observation and I end up stopping in the water to let him clear close ahead of me. The traffic level was low and plenty of clear space around me so curious as to why the course change and close encounter. I clear the southbound TSS at 13:00 (BST) and on reaching the Dover Harbour entrance get an immediate entry clearance, mooring up in the tidal marina at 14:30. Alice Pellow is already moored up on an adjacent pontoon having made the trip an hour faster than me. By way of compensation Dave invites me to join them for dinner. Another hose down session then a shopping and refueling visit to the BP garage provides some exercise but completes the chores. 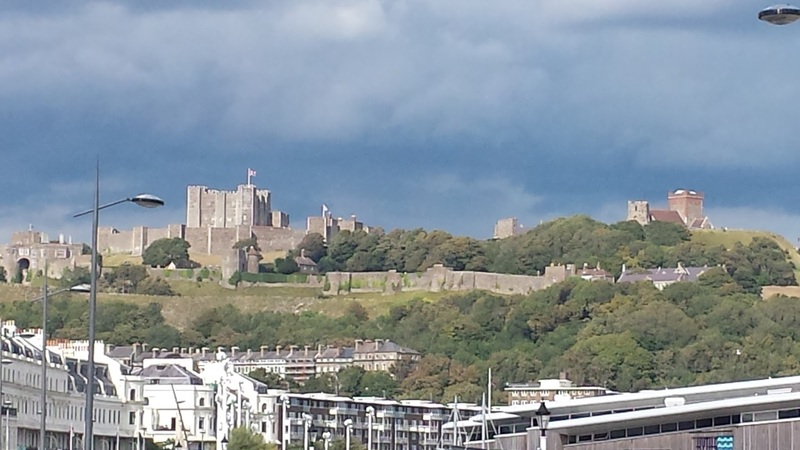 Dover castle for a view once again. This time without the storm. Remembered to claim my berthing discount this time, £10.00 for the night with electric. The passage plan for today is from Dover to Eastbourne, a distance of 45 Nm. The forecast is for fine weather and light winds (SW so on the nose), the tide is favourable from 10:00 to 16:00. 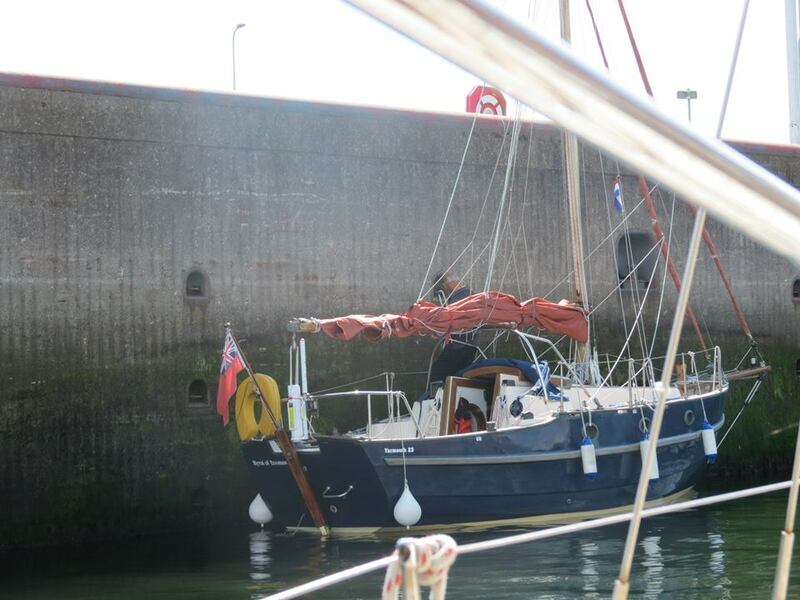 I leave Dover Marina at 06:00, Alice Pellow gets away ten minutes ahead of me and clear of the harbour. I get held at the west entrance for over ten minutes before getting clearance, giving Dave a good head start on me. I round Dungeness at 10:30. On route for Eastbourne I realize that we are making good time and that the further west we go the longer the tide is in our favour, continuing on to Brighton looks a good option. The only concern is that the weather is due to deteriorate drastically by midnight and it would not be advisable to be at sea. Monitoring the weather forecasts it seems the bad weather will not arrive early so I call Dave on the radio with my suggestion, to discover that he has been considering the same option. We agree it is a sensible move and amend our plans to make for Brighton Marina, although Dave still has to stop off at Eastbourne to collect items that have already been dispatched there. With his earlier departure from Dover and passage speed he should still make Brighton ahead of me. The revised passage plan works out well and we both make Brighton Marina for early evening and, with our shoal draft, are able to enter on the low water while larger boats are having to stand off. Another windmill, I must be in ....England. 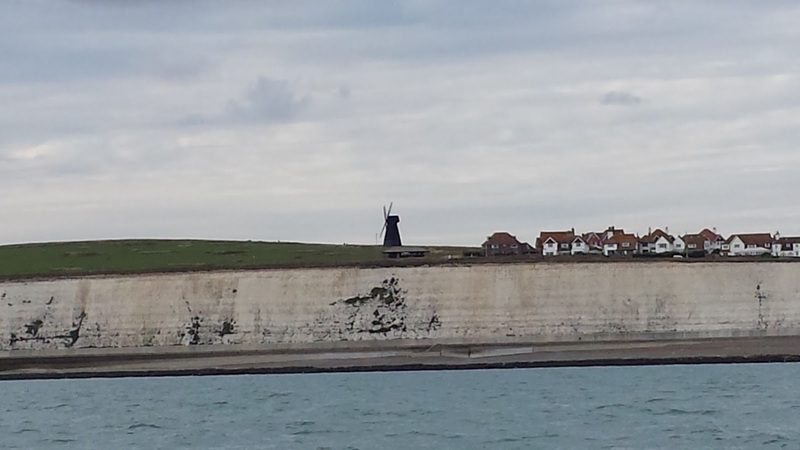 The landmark windmill on the eastern approach to Brighton. It has been a great day to be afloat, dry and bright with calm seas and light winds (just from the wrong direction). The beautiful coastline from Dover going west to Beachy Head, the Seven Sisters and Seaford Head providing an enjoyable contrast to the North Sea coastline of France and Belgium. The only thing missing was good company to converse with and share the pleasure. On the down side, during the late evening a large ketch enters the mooring aisle that I am on and attempts to moor on the windward side in what is now a strong cross wind. In addition the tide is setting across the pontoons in the same direction as the wind. The skipper of the ketch has not anticipated/noticed the conditions, fails to make the mooring and loses control of the boat. Mayhem breaks loose as the ketch makes contact with two boats on the leeward pontoon and starts to bear down on Hyrst. There is every danger of Hyrst being crushed but fortunately crews from adjoining boats rush to assist, fending off and creating enough space for me to motor out as the ketch gets carried into the space I had occupied. A very close call. Not a sign of any marina staff during all the mayhem yet the office overlooks the visitor berths. The forecast bad weather sets in overnight with torrential rain and gale force winds. The visitor pontoons in the marina are being subjected to a strong swell being funnelled in the harbour entrance and Hyrst is rolling the rubbing strake under the pontoon edge. I go on deck and fit a fender curtain to the hull and rearrange fenders to minimise any damage but have a disturbed night in the conditions. The rain and strong winds are set in for the day, no possibility of continuing the journey home so Dave and I book the boats in for an additional night, although not an ideal place to be weatherbound especially at £24 a night for Hyrst v. the typical €12 or less I have been paying. During the day the visitor pontoons become untenable and Dave contacts the office to arrange a berth in the residents mooring area for Alice, then insists that I do the same before Hyrst is damaged and assists me in moving to the new berth. The rest of the day is spent walking in the rain (washes the salt out of the foulies) or on board trying to make use of the restricted wifi available. In recognition of Dave's chefing in Dover I provide an evening meal for the three of us aboard Hyrst along with COLD beer - the fridge on Hyrst works, not so on Alice! We make passage plans for Tuesday based on a marginally acceptable forecast, Dave bound for Emsworth with Alice and me for the Solent with Hyrst. My intention is to get to the Solent today, either Portsmouth or Cowes depending on progress. The weather forecast is not good with F5-6 SW winds and a moderate sea state but with winds lessening and backing during the day, fine then rain later. The tide should be favourable as far as the forts. Dave and Cory set off in Alice just before 7am, I follow at 07:30 after my usual faffing around plus deciding a good breakfast and a prepared lunch were essential, it could be a long day. Once clear of the marina entrance I wonder if it is a wise decision to be out there, the conditions are on a par with the Breskens - Blankenberge trip and once again I fit all washboards and secure hatches. In these conditions it is a relief not to have crew to be responsible for and concerned about, conversly a trusted and trusting crew member would have been welcome. I contact Dave by radio and he confirms that it is heavy going on Alice but not getting any worse as he heads west. We both opted to go via the Looe Channel when making our passage plans, however, given the conditions I change my route to go via the Owers buoy and notify Dave as we have agreed to keep in radio contact if possible. I have a French yacht for company that followed me out of the marina and two other yachts (one a tri) pass in the opposite direction on my way to the Owers, no other pleasure (?) boats out there. As hoped for, the wave interval lengthens as I move into deeper water and by the time I round the Owers buoy conditions are much improved and get progressively better as I near the forts. 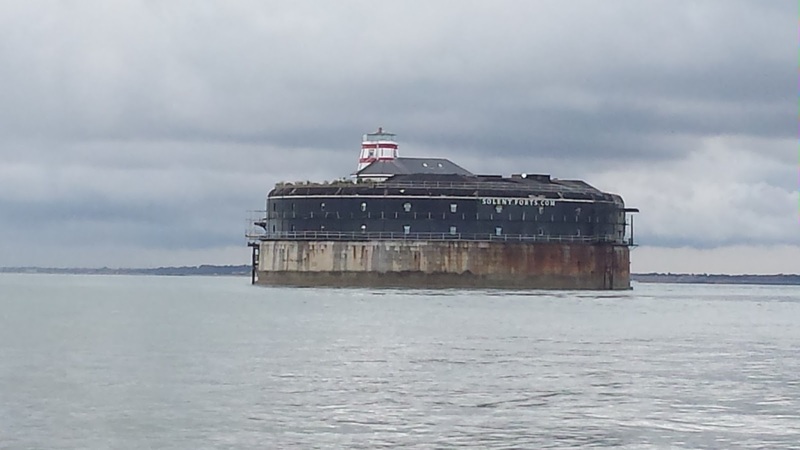 I pass inside of No Man's Land Fort and decide to continue on to Cowes as it will take no longer than fighting the ebb into Portsmouth and more importantly takes me towards home. I make Ryde Sands at 16:00 as the tide starts to turn on me but at least the headwind has fallen away. The adverse tide brings my SOG down to around 3 Kts but after all the motoring I have done over the past few weeks it seems quite normal to push on under power and I make Cowes entrance by 18:30. The long overdue easterly wind has just kicked in, along with the rain, giving a lift to my speed. The thought of turning in to Cowes for the night with my end of cruise destination so close doesn't add up, so I set the foresails in addition to the main and plod on for Lymington. I phone ahead to the Yacht Haven and arrange a berth for the night, munch a few more gingernuts and curse the rain as I will have to stow wet sails and dry my oversuit yet again. It seems strange but satisfying to stow the sails at the entrance to Lymington river and head in to my berth knowing that I have just experienced a very special few weeks, it is dark and raining but I am a happy chappy. To take my smile away the berth I have been allocated is on P pontoon near the fuel dock (never knew there was such a pontoon) and it proves impossible to identify in the dark, so I end up getting the duty night staff to guide me in by torch light. Never mind, Hyrst and I are home, moored up at 21:00. The landmark that tells me I am back in home waters six weeks to the day after setting off. The weather forecast for the next few days is not favourable (actually dire) with today offering the only possible window for going to sea. At our skippers meeting I decide to make for Blankenberge and Barbara opts to do the same, Marion has ongoing concerns about the engine on East Breeze and decides not to take undue chances with it on what is likely to be a testing motor-sailing passage. Amanda chooses to go as crew on Moon River in order to meet her travel schedule. The tide is favourable from 08:30 to 14:00 but will give wind over tide conditions as the wind is a near headwind forecast to be WNW 17 Kts gusting 26 Kts. With the shallow coastal waters here and a 3 Kt tide an uncomfortable trip is certain. 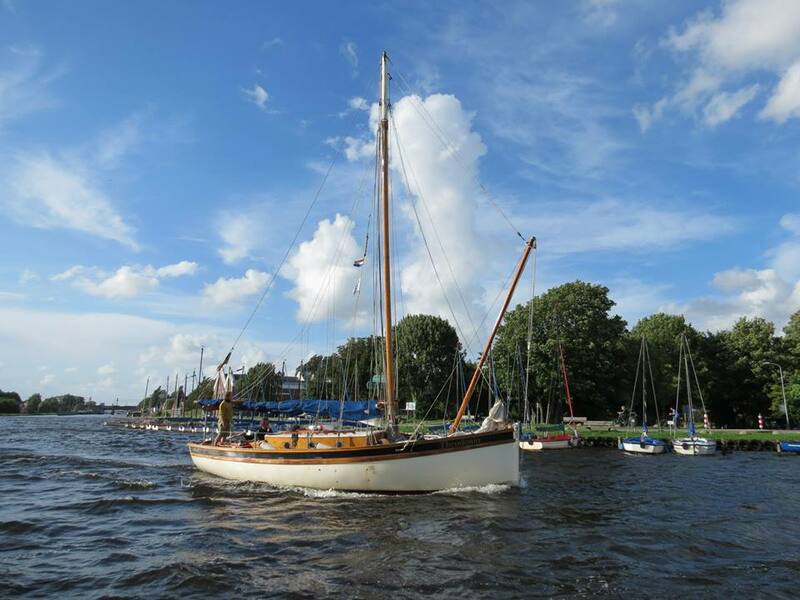 I depart Breskens at 09:30 motor-sailing under main with two reefs, Moon River is due to follow soon after. The Westerschelde is rough but improves slightly once out of the strongest tidal flow beyond the first headland. My route takes me west to stay clear of the Zeebrugge entrance and the sea state worsens as I get into shallower water again prior to Zeebrugge. Hyrst is being thrown around in both planes by the confused seas and taking a lot of solid water over the decks so I decide to fit all washboards and secure hatches in the event of the cockpit taking a lot of water. The autohelm is struggling in these conditions and I spend most of the time helming to work the waves, our SOG is around 7 knots with the tide under us, more than I planned for and raising the possibility of arriving too early at Blankenberge (low water entry not recommened). By this time I am caked in salt so hand back to the autohelm while I have a drink and wash my eyes out with fresh water. Opening a fresh bottle one-handed whilst hanging on to the pushpit isn't working so I let go the pushpit and get a grip of the bottle - just as a large beam wave throws Hyrst violently to port. I am launched across the aft cockpit over the tiller and coming down hard against the autohelm and pushpit with my safety line halting me. I recover postion on the next lurch of the boat, but my left upper arm does not feel good and the autohelm is u/s, jumping around and detaching from the tiller when under power. Placing my arm in the lifejacket harness as a makeshift sling helps and I am able to rest it whilst getting on with helming, firmly wedging myself in a cockpit corner. I then notice a warp which had been attached to the samson post coiled, tied and lashed on was trailing aft down the port side! Managed to get that inboard before it got somewhere nasty. The trip remains rough all the way to Blankenberge but I know there is calm water and space in the harbour to sort things out. Moon River has caught up with me and follows me into the harbour. My left arm is still painful but has normal articulation so I manage to stow the main and prepare the boat for berthing once in the shelter and as we enter the marina the harbour master is on hand to allocate berths and take our lines. Moored up at 13:30, then a much needed hosing down of my foul weather clothing and the boat. Hyrst of Eremue alongside in Blankenberge after a tough day, possibly the roughest I have been out in. Despite being well stowed for the passage the contents of the cabin have been dislodged and thrown around more than I have ever experienced before. The weather forecast only confirms what can be heard in the rigging and seen from the flags, no sailing today. I am fairly certain that my arm injury is just severe bruising but obviously not up to any heavy work, so a rest period is in order anyway. With usable internet access and time available I take the opportunity to update my blog, do a web search for autohelm availability/price/delivery and make forays out of the cabin between the rain. Again the wind strength dictates no sailing, heavy rain showers also predicted for the day. My first priority is to source a replacement autohelm as the damaged one is definitely FUBAR, and I go in search of local chandlers. Unfortunately there are no autohelms available over the counter at the two chandlers I locate, so I convert the search into a sightseeing opportunity to the south side of the harbour. The sea state doesn't look too bad from shore but there is a distinct absence of any boats out there. On the way back to the marina I do a provisioning shop in town and return by way of a cake shop, at least dinner will be worthwhile. Later in the day we receive a visit from Marion who has got a little tired of the Breskens scenery and taken a train/tram tour along the Belgian coast, calling on weather bound gaffers including Bonify which is in Ostend. Amanda departs for the rail station homeward bound by rail and ferry. Not much left to do for the remainder of the day except transfer fuel from one of the spare cans into the main tank ready for departure, feed, do yet more weather checks, read and do another blog update. The first task today is to find the Harbour Master and pay for another days mooring, the wind is still howling and we are not going anywhere. He is happy to take the money and confirms that there is no issue with staying on the berth as the regular occupant is weather bound elsewhere and cannot get back. At least the marina fees are reasonable at €14 per night including electric v. the typical £25 or so it would cost on the UK south coast. Then yet more sightseeing to pass the time and get some exercise. On a more constructive note I get around to fitting the fiddle rails I brought with me to the saloon shelves, which in turn leads to a chat with my Belgian neighbour who provides me with brass screws when I ask where I can buy some. Surprisingly he has been following Hyrst on AIS and via the blog as he has a connection with the traditional/gaff boats in the region. Between walkabouts and chores Barbara and I have the occasional conflab on passage options and suitable ports, it is obvious neither of us will make the Y23 Solent event but she is trying to get to St Valery en Caux in time for an event there and I still have a chance to make the St Vaast rally. At last, a weather window, the forecast is for wind F3-4 WSW and early heavy showers turning fair. 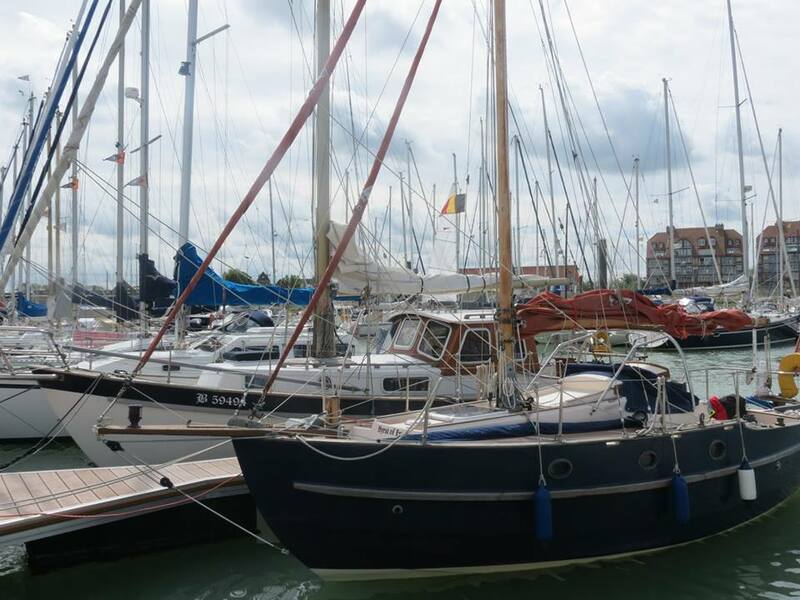 The tide is favourable from 12:30 and in company with Moon River I depart the marina at midday bound for Dunkerque but prepared to divert into Oostende or Nieuwpoort if conditions dictate. It is another motor-sailing trip under reefed main as the wind is still close on the bow for most of the passage. The sea state is a moderately lumpy swell in the wind against tide conditions but relatively comfortable, had the wind been more free it would class as a good sailing day once the rain passes through. By the time I am off Nieuwpoort the wind has reached F5 and conditions are less pleasant but no reason not to continue on to Dunkerque. Barbara is running Moon River under power only and pushing on ahead of me and I hear her on the VHF contacting what I believe to be High Barbaree, which must be one of the gaff rigged boats I can just make out on the horizon. I call Moon River on the radio and Barbara lets me know she has decided to follow the other boats which are making for Calais, did I want to do the same? As I am without an autopilot and it is a further four hours or so to make Calais, plus I have not done any plans for that passage or harbour night entry I decline and confirm that I will still make for Dunkerque. My left arm is already feeling the effort of todays sailing. I wish her a safe passage and focus on entering Dunkerque. Bearing in mind my outbound experience of this harbour I have chosen to avoid the Port du Grande Large marina and go into the YCMN marina. I contact them on radio and after an initial misunderstanding on berth location have Hyrst moored on a finger berth at 17:45. I receive a cheerful reception at the office and find that the marina has all facilities and a decent restaurant/bar. A Dutch couple in a Folkboat are moored next to me, on their way home to Amsterdam after cruising to the Solent, loved Yarmouth. They had great sailing weather with following winds both ways. Don't I know it! I give Hyrst and my sailing suit a hose down, hose myself down in the showers and after a meal onboard call it a day, satisfied with the progress made. As predicted the weather window was short lived and the forecast wind today is F6 WNW, not suitable for a run to Dover nor a halfway trip to Calais. Tides not very favourable either. My main task is to buy and fit a new Autohelm even if I have to get one shipped to me. First though I have to make a check on Alice Pellow, moored on the same pontoon as Hyrst. Dave and Kay made the passage from Holland via the Roompotsluis and down the coast, gaining two days over my route in conjunction with their greater speed. However, the bad weather that held me in Blankenberge did the same for them at Dunkerque and they opted to go home by ferry and return for the boat once conditions became more favourable. The marina staff give me directions to two local chandlers and the second turns out to be large and well stocked with practical items (not just clothing). Even better, they have the exact model autohelm I require and at a price not too far in excess of UK prices, they also accept UK credit cards! On return to Hyrst with the new item I discover that the actuator extension on the old autohelm (an add-on) is siezed in place and not likely to shift without workshop facilities. Back to the chandlers and unbelievably they have the correct size extension in stock, perhaps I should do the lottery today as well! Next problem, the electrical connector for the new autohelm will not fit the boat mounted socket due to different orientation keys, so I have to fit the new socket provided with the unit. Nearly there, but the new autohelm is electronically set up for starboard mounting, Hyrst has a port mounting so it operates arse-about-face. A bit of manual perusing has that sorted and once again we have a serviceable autohelm - success. 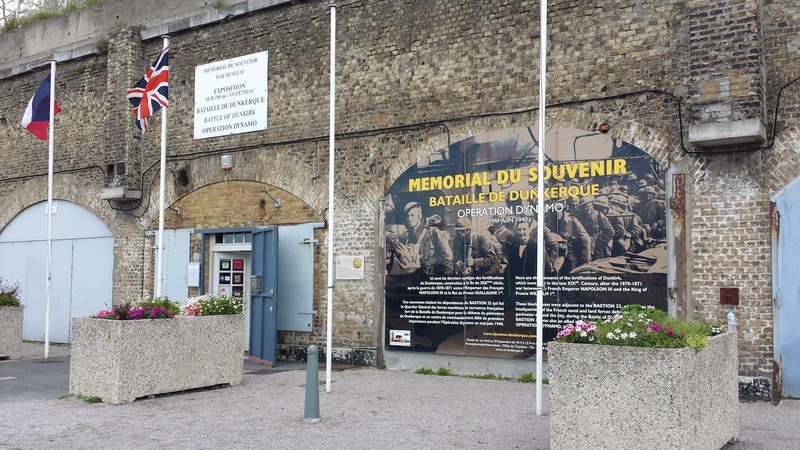 In the afternoon I make a visit to the Dunkirk evacuation museum, now able to relate the beaches I have seen to the records of the event. The walk there from the marina gives me the chance to check out the wind force at the coast, staying in harbour was the right choice. I continue on into town for a coffee and cake stop plus some more shopping and on reassessment, decide that it is not such a bad place afterall, still not a first choice harbour but OK for a stopover. The "Operation Dynamo" Dunkirk Evacuation museum. A must-do item on my itinerary. Another day weather bound so finding work to keep me occupied and get prepared for the rest of the return trip to the Solent. Refueled the boat and filled both fuel cans, got the laundry done despite a defective dryer that ate my Euro coins (did get a refund for that). Dave and his son Cory are travelling to Dunkerque today anticipating the weather will be good enough to move Alice Pellow, I have got the marina to arrange a taxi pick-up for them at the ferry terminal. Marion is also due to arrive early evening with East Breeze having moved on from Breskens to Oostende during the last weather window. I have reserved a finger berth for East Breeze so all admin jobs done. Evening sees the arrival of Dave and Cory via ferry from Dover. They commented that the sea state didn't appear very encouraging when viewed from the ferry. Dave has booked a table for us in the marina restaurant pending the arrival of East Breeze but it is now getting dark and no sign of arrival yet. I subsequently get a text from Marion at 19:40 saying she is at the harbour entrance. I go to the arrivals pontoon to direct/assist Marion in while Dave and Cory hold the fort at the bar. Once East Breeze is moored up we gather in the restaurant for an enjoyable meal and a couple of drinks whilst agreeing our plan for the morning - an early start (05:00) for Dover subject to a final weather check before departing. East Breeze requires reserve fuel so I drop one of my spare cans off prior to getting Hyrst ready for a quick departure and then turning in. The jungle telegraph (in the from of text messages) suggests that Willemstadt is a likely rendezvous point for several of the dispersed gaffers heading south, which fits in well as the next destination from Ijsselmond. The route will be east then south east on the Noord, negotiating the Ablasserdam bridge (opening 2 hourly at 15 mins past), then on to Dordrecht. From here we bear south west on the Oude Maas via the Dordrecht rail bridge (opening hourly at 12 mins past) then on the Dordtse Kil and Hollandsdiep to Willemstadt. The Noord canal has a strong tide determined flow which is favourable from late morning, East Breeze and Moon River depart ahead of me to take full advantage of it whilst I do my usual faffing around and eventually cast off at 12:15. Whilst preparing to leave I notice Bonify passing the marina entrance probably heading for the same destination. Later, when following the right hand bend on the Noord at Slikkerveer I come across an incident where a barge has lost control and taken out some shoreside gantrys and piles and is jammed at an angle partly out into the canal. A police patrol boat is on scene with blue lights and code flags showing so I pass at a safe distance and continue. Shortly after the police launch pulls alongside me and indicate they wish to talk to me. Hum, I am motorsailing with no cone up, however, this omission is ignored by the police and they instruct me to keep well into the edge of the canal (where I had been and was returning to after avoiding them) as if to make a point of their presence. I had noticed on the cruise though that Brit skippers have a habit of running mid-channel so perhaps some precedence for the police. 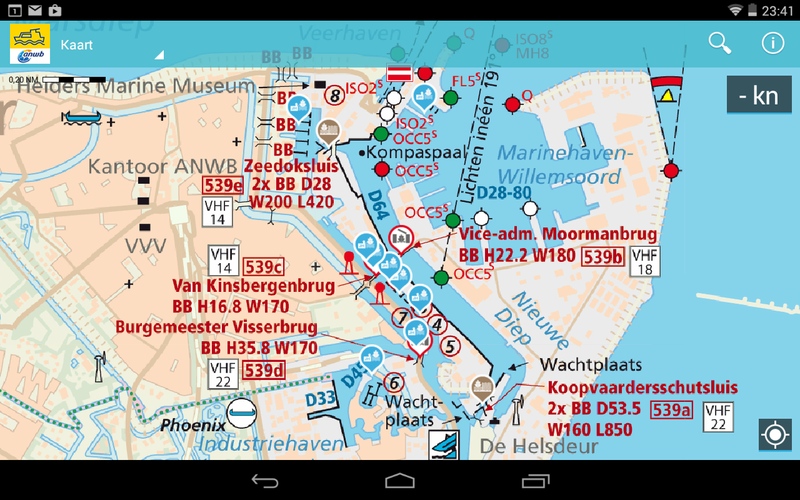 I press on for the Ablasserdam bridge and get the 13:12 opening. A view of the Ablasserdam bridge with East Breeze on the approach (pic. Barbara Runnels). I had passed under this on my trip north but turned back on my attempt this time and waited for the next timed opening. The crew on a Dutch motor boat alongside me during the bridge approach looked decidely concerned as I edged closer to the span! The remainder of the passage goes goes without incident and during the wait for the Dordrecht bridge I am joined by High Barbaree and one of the other Belgian gaffers. The trip through Hollandsdiep proves to be a wet one with the still strong SW wind kicking up a chop and some spray. 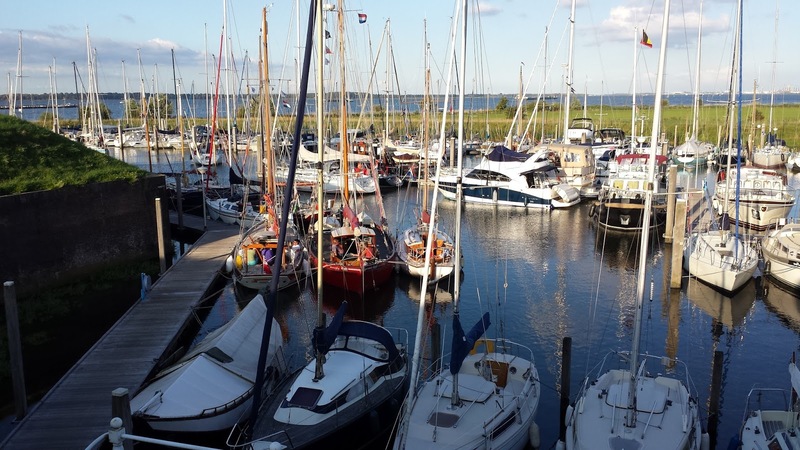 I arrive at the Willemstadt harbour at 18:30 and join what is turning into a gaffer rally with several of the fleet present. Gaffers rafted out equals a social gathering. 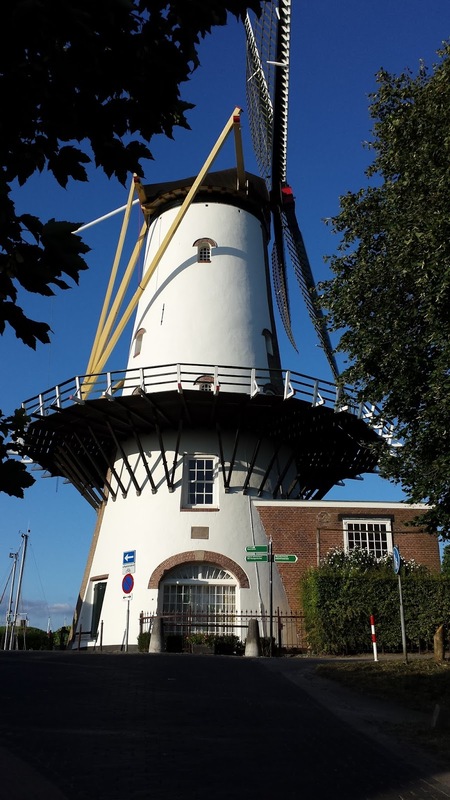 A beautifully presented windmill overlooking the harbour. The town is very attractive and a popular tourist location. A place I would certainly visit again on any return. Decision time again for the skippers on the best route from here. 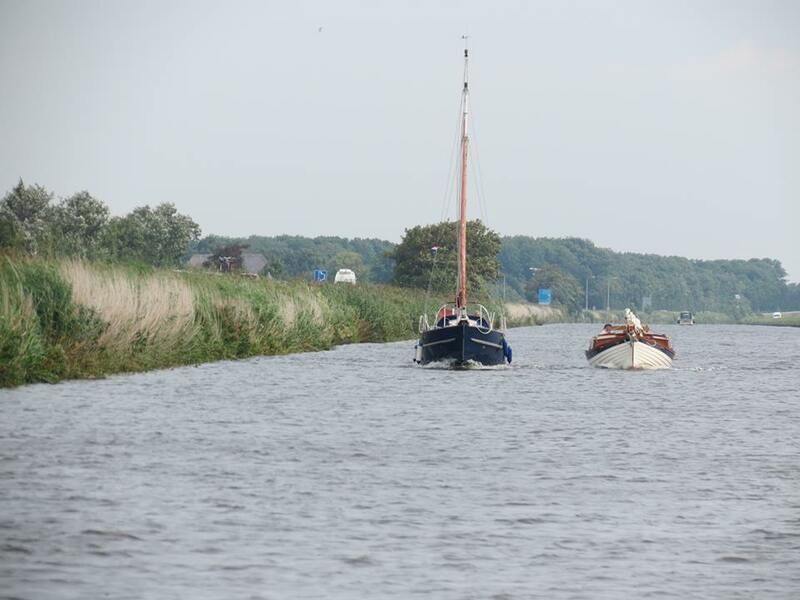 Some of the larger boats elect to head for the Roompotsluis and then into the North Sea as the winds are expected to abate enough to allow coastal passage making. 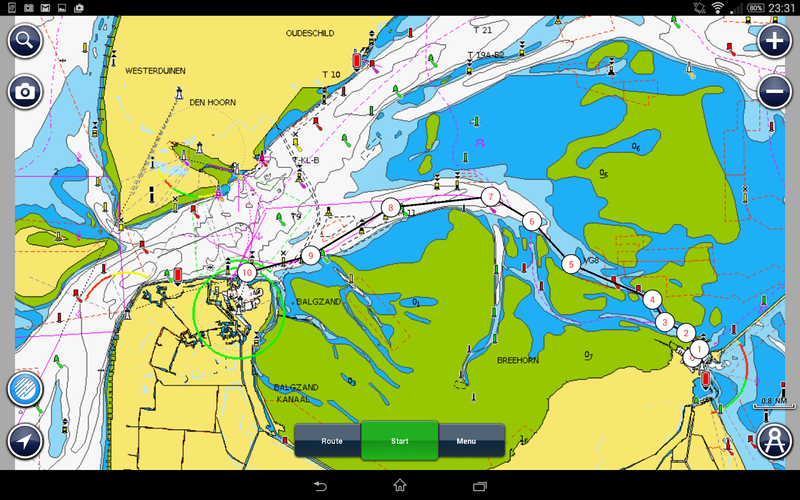 As a single-hander on a small boat I choose to stay inland and make my exit to the sea at Vlissingen with the next enroute stop at Kortgene or nearby. 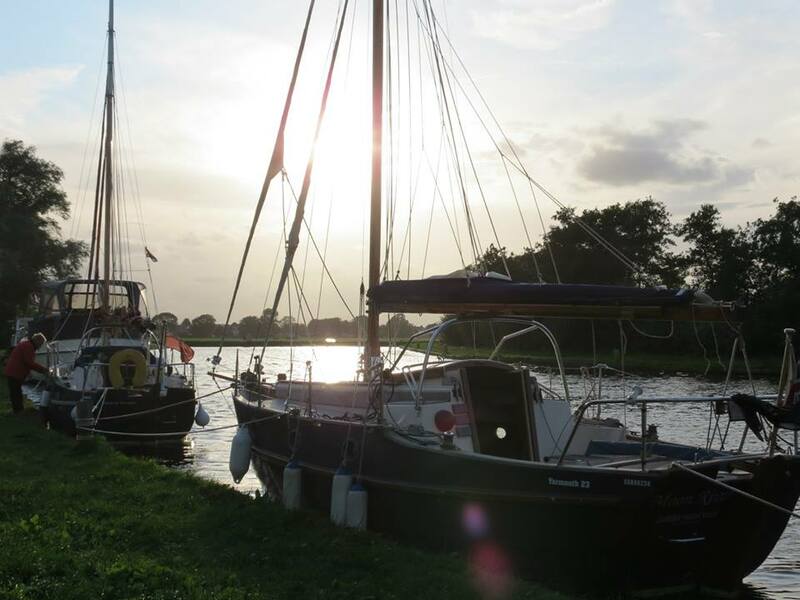 From Willemstadt we exit east directly to the Volkerak lock (2) and SW along the Volkerak to the Krammer lock (16). 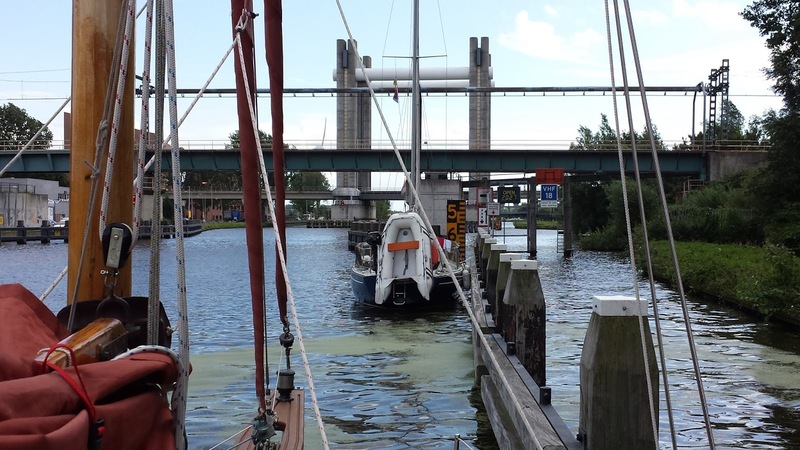 Exiting this lock we retrace our earlier northbound route along the Mastgat and Keeten waterways then continue on to the dominant Zeelandbrug (21) which spans the Oosterschelde. At this point boats heading for the North Sea will continue west via the Roompot and Oosterschelde waterways, I will turn south and into the Zandkreek (23) through the lock (27) and on to the Veerse Meer. East Breeze and Moon River will be taking the same route as Hyrst of Eremue. I depart Willemstadt marina at 08:00 and stop at their fuel barge for diesel, then on my way by 08:15 for the Volkerak lock in company with Moon River and East Breeze. The day had started with fine weather but as we exit the Volkerak lock torrential rain sets in. The wind is still strong F5 and from the SW making for a cool and splashy passage but we press on and reach the Krammer lock at 11:30. After clearing this lock the rain stops and we just have the head wind to contend with, although on turning into the Zandkreek I set the foresails for a while and give the engine some respite. Three Solent boats, Moon River, Hyrst of Eremue and East Breeze on the wait pontoon at the Zandkreeksluis. Yours truly on Hyrst contemplating the mooring options in the Zandkreek lock. Hamble boat Beagle came from nowhere and joined us in the Zandkreek lock, then powered off into the distance. Guy and Lesley had turned around at Enkhuizen then left the boat moored whilst returning home during the previous bad weather. Guy was back with fresh crew and on a mission to get back to the Solent asap. Transit through the Zandkreek lock goes smoothly and we arrive at the Kortgene marina late afternoon. Moon River experiences an engine-not-starting problem whilst we are on the arrivals pontoon but all is soon resolved and we are given moorings in the Landbouw haven with easy access to the town. The marina is on the expensive side at €15 plus extras but with good facilities. It has been another long and tiring day so I am not going to complain. I make an offer to provide dinner for the evening which is taken up by Barbara, Marion and Amanda (crew on EB) so make an evening shop for provisions then press my Polish galley slave (Remoska) into action, concocting what turns out to be reasonable fare helped down with the last of the OGA beer and some wine from the cellar (bilge). Today will see us out of the inland waterways and coastal once again, although the crossing from Vlissingen to Breskens is dependent on the sea state we encounter when we get there, there is still a F5 SW wind blowing and the strong tidal stream in the Westerschelde needs factoring in. 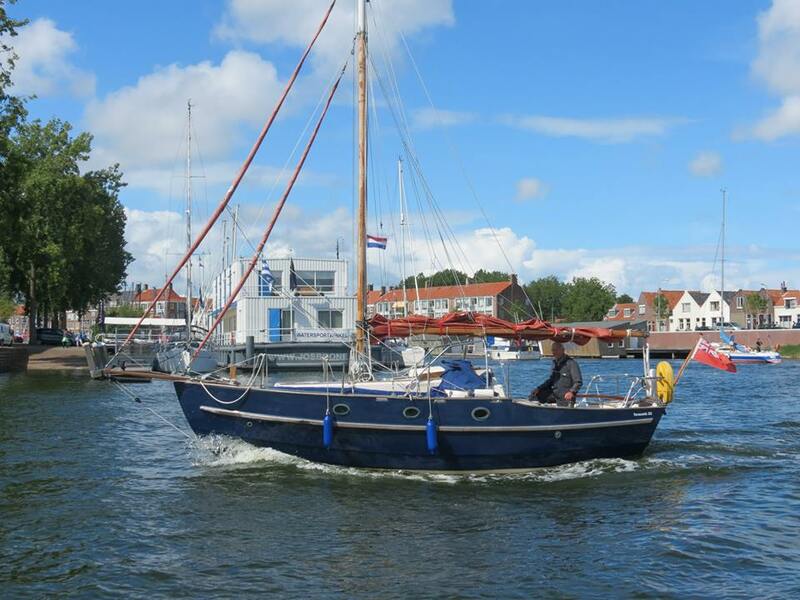 The route is straightforward sailing on the Veerse Meer to Veere then taking the lock into the Kanaal door Walcheren, on past Middelburg to Vlissingen then following the small boat passage across to Breskens. Four bridges and three locks to pass through today. All three boats set off from Kortgene at midday in fine weather although over-suits are initially required to combat the wind and spray. Our departure time is intended to get us to the Westerchelde for slack water. 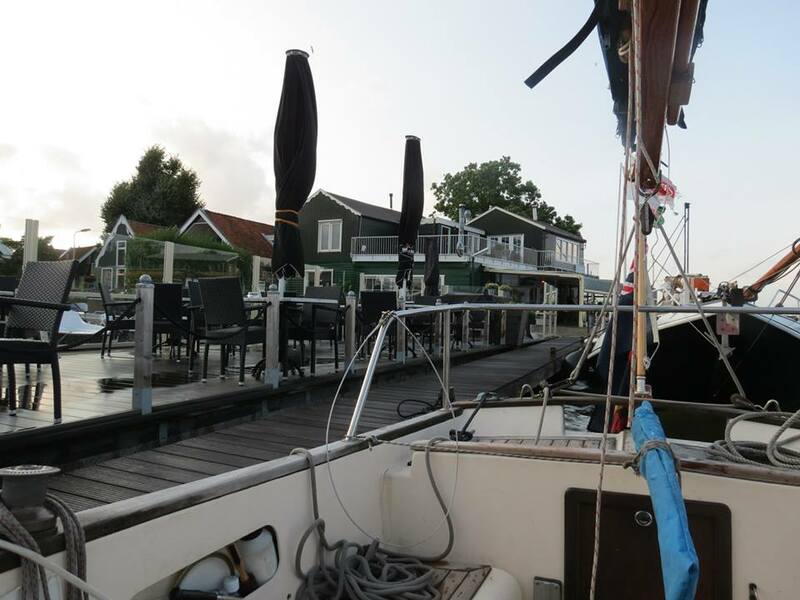 In comparison to my novice arrival sail here I can appreciate the Veerse Meer far more now and wish there were more time to spend in the area - for another trip perhaps. We reach the Veere lock at 14:15 and have to hold for around 15 minutes until we can lock through into the canal. A good passage down the canal ensues and we reach the Vlissingen lock at 16:15. During our passage through the bridges and locks at Vlissingen we have the pleasure of Erik Frenks (one of our hosts) and his daughter cycling the canal path to keep us company (he had been following my AIS track). Passing the harbour entrance at Middelburg with the temptation of the floating chandlery at the entrance being resisted. The passage through the Vlissingen lock results in a few stressfull moments as the wind causes some difficulties but we emerge intact into the Westerschelde. It only takes a moment to ascertain that the crossing to Breskens is going to be a rough one, the wind in open water is around F6 and there is still significant tidal ebb running creating some unpleasant conditions. After a wet and bumpy crossing in convoy we arrive at the Breskens Marina arrivals pontoon, a somewhat exposed spot in the conditions. There is a phone box on the pontoon for use in contacting the office, however, getting alongside the pontoon is risky so I call the marina on VHF and request berthing information. In the meantime Marion and Amanda have managed to get East Breeze alongside the pontoon and Marion concludes the berthing details by phone. The marina layout is unclear but we eventually find our allocated berthing and moor up by 19:00. The marina fee is €13.75 including electric. Good food and beer are found ashore and I turn in for the night with the sound of the wind howling in the rigging and contemplating being harbour bound for the next three days as the wind is forecast to increase. I also noticed that I had exchanged ducks for gulls as local water inhabitants! 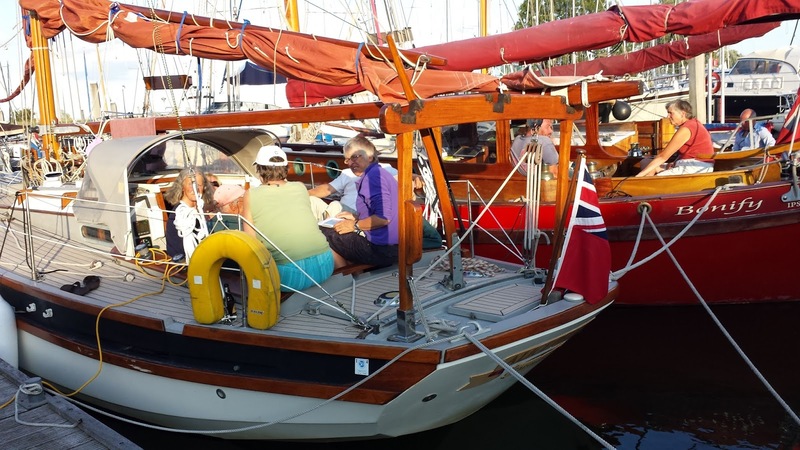 When setting out on this cruise I had in mind returning to the Solent in time for the Yarmouth 23 Owners Association rally on the 16th -17th August and/or the annual KYC/LTSC cross-channel cruise to St. Vaast on the 21st-25th August. To attend the Y23 event requires a return passage via the North Sea and favourable weather for the complete return jouney, this is now unlikely given the North Sea is a no-go area for the next few days, but still worth a try if I can get back onto the North Sea at Ijmuiden. The strong SW winds are due to continue for some days, with gale warnings in effect. I am not sure how tenable the inland waters will be in these conditions but decide give it a try. 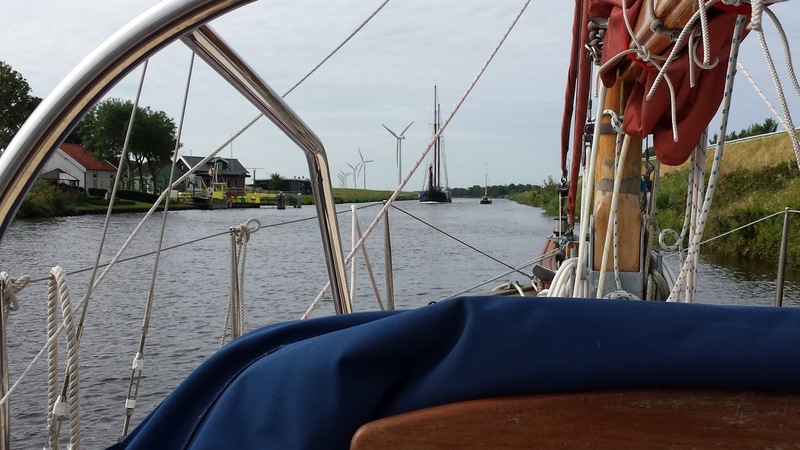 Most skippers are still considering plans for the day as the SW wind is now reaching gale force, however, Barabara opts to tag along with Moon River and we set off at 09:00 heading south on the Noordhollandsch Kanaal. Neither of us have a specific destination other than to make as much distance as conditions and time sensibly allow. Getting within easy reach of Ijmuiden and Amsterdam would be good either to access the North Sea or leave the boats parked up. 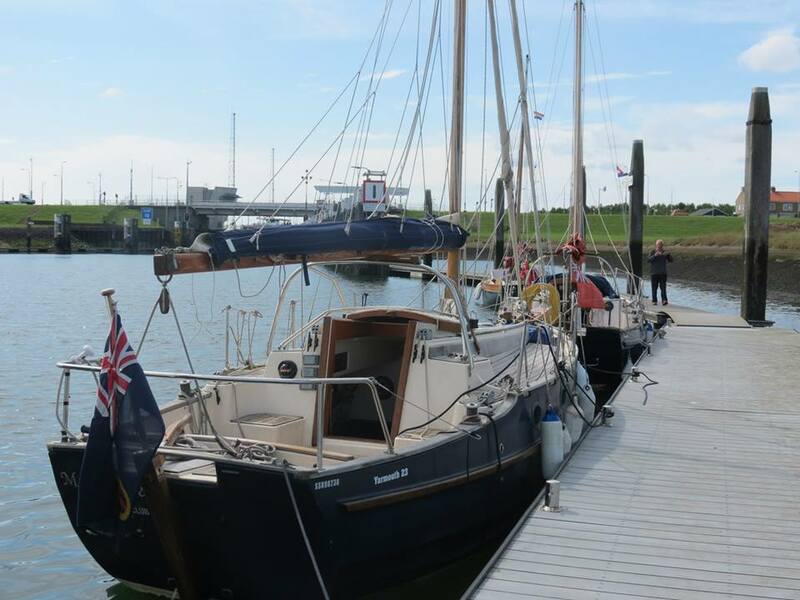 If you want to make good time it pays to set out prepared, "Jan Blank" one of the Dutch gaffers who took the time to lower their mast at Den Helder in company with Hyrst. No bridge waits for them. With no locks to negotiate and my radio communication with the bridge operators proving adequate we make good progress, the rail bridges at Koegrass (7) and Alkmaar (23) open at 30 minute intervals and do not cause undue delay. The strong wind is only an issue when holding station for the bridges. 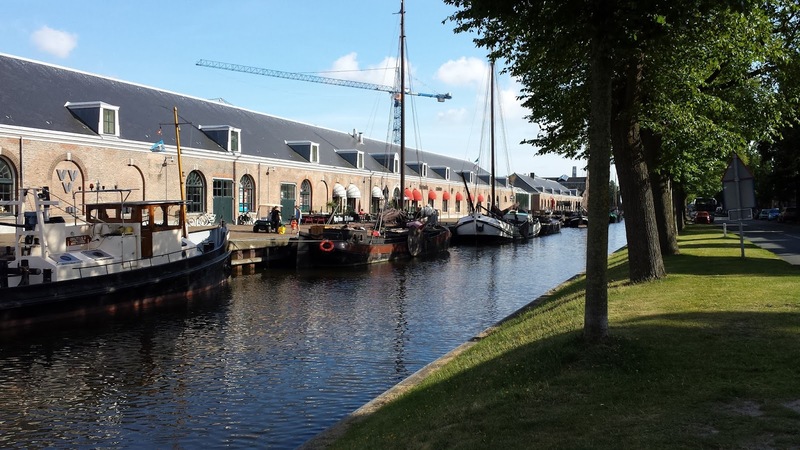 Alkmaar looks worthy of a visit if passing this way again. When we reach Alkmaarder Meer (31) and move into open water the full strength of the wind becomes apparent with the short choppy sea and head wind requiring almost full throttle to maintain progress. A rescue boat and helicopter arrive on scene as we are crossing and go to the assistance of what appears to be a sunken keel boat, possibly swamped in the conditions. A dutch motorboat is also assisting and we continue on passage. We reach Woudaap at 17:00 and have a choice of route onward to the Nordzeekanaal but I have not done any detail route planning for either option. Barbara and I agree that we have had enough for one day and reconnoiter the local options for mooring, most of which look hazardous in the conditions. We settle for an alongside pontoon with space for both boats at a canal side restaurant. Mooring fee €17 for both boats on the understanding we patronise the restaurant. The North Sea is still a no-go so no point in going to Ijmuiden and if we can maintain good progress then no point in leaving the boat at Amsterdam, so press on south. We depart Woudaap just after 09:00, and retrace our path back through the Beatrix bridge (2) having decideed that the locks and bridges on the Nauernasche Vaart are suitable and offer the best route. The wind is still strong and continues to make bridge waits a concern but does not hinder progress along the canal. I have no wind measurement instruments on Hyrst but receive a report from Dave (Alice Pellow) that they are recording wind speeds of 40 Kts at their location around 20 miles further south (they left Den Helder a day earlier). At a later bridge wait I raft alongside a large Dutch Hallberg Rassy and the skipper shows me the graphic record on his instruments showing winds consistently above 50Km/h (F7) during the day. We make good progress and reach the only lock on this canal at Naurna (9) by late morning, then suffer a delay of approximately 30 mins waiting for the road bridge (10) south of it to open. The waiting points are not tenable single-handed so we both have a trying time holding position. Once through this bridge we are back onto the Noordzeekanaal and retracing our route of the 2nd August, entering the Zijkanaal at (12) heading for the time critical Spaarndam bridge and lock. We reach the Spaarndam bridge in time for the 12:00 opening, this time uneventful for Hyrst, and have plenty of space in the lock without a fleet of boats for company. Given the conditions there are few local boats underway. 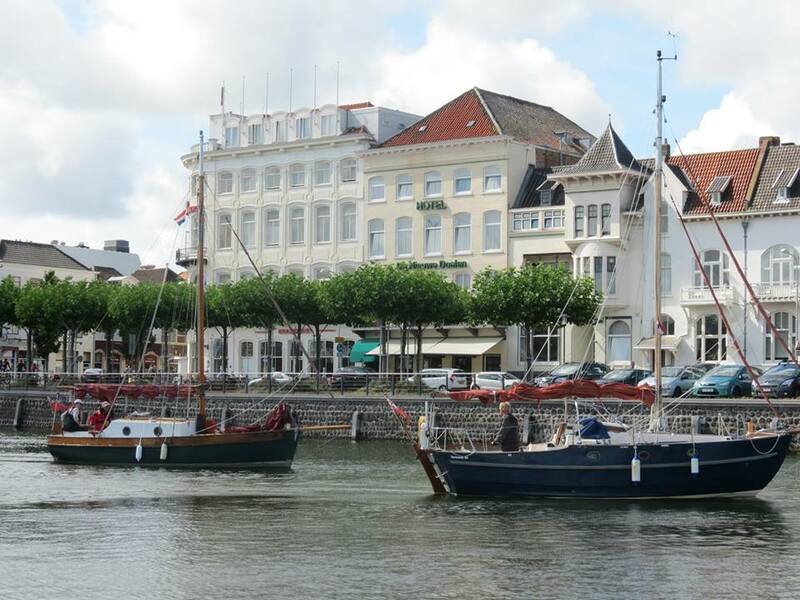 Haarlem is reached at 13:30 and we duly moor up and pay our transit fee, with Barbara making the payments whilst I tend the boats (only €9.70 this time, must have omitted the bowsprit length). We agree on a destination of Braassemer Meer for the night and push on south along the Spaarne, Haarlemmermeerpolder and Ringvart to the road/rail bridges at Sassenheim in time for the 18:30 opening. The Belgian gaffer "Theodosia" joined us at the Sassenheim bridge wait. Once clear of the bridge we make good speed towards Braassemer Meer but on reaching Weteringbrug we find the bridge into the Oude Wetering canal toward Braassemer Meer is closed/defective. Theodosia chooses to pick up a canal side mooring near the bridge, Barbara and I turn around and head in search of a quieter spot on the Kever Water at Kaarg. Lake side overnight moorings for Hyrst of Eremue and Moon River at Kaarg. A lovely spot but somewhat spoilt by severe thunderstorms during most of the night! No facilities and no charge. 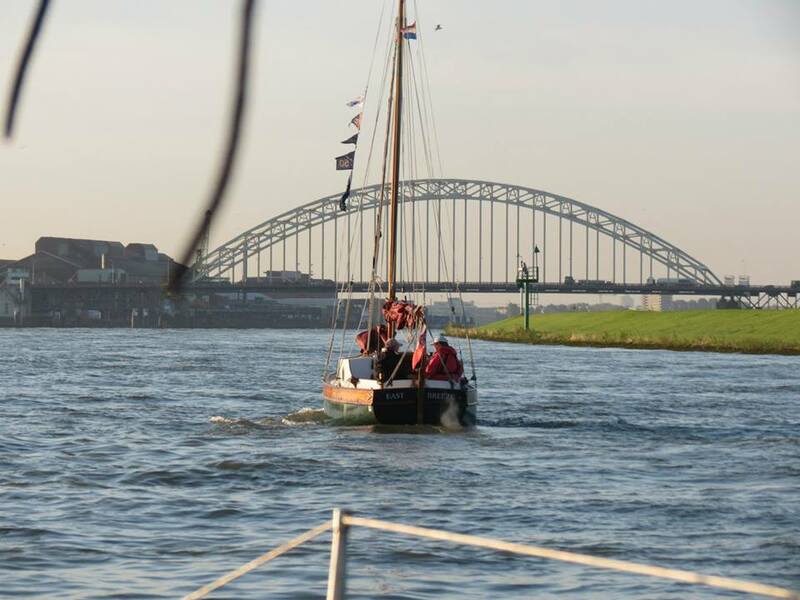 The wind is SW F5-6 and rain threatening as we get underway at 08:30 and head to Weteringbrug, only to meet Theodosia coming toward us and passing the message that the bridge is still closed and we have to find an alternative route. 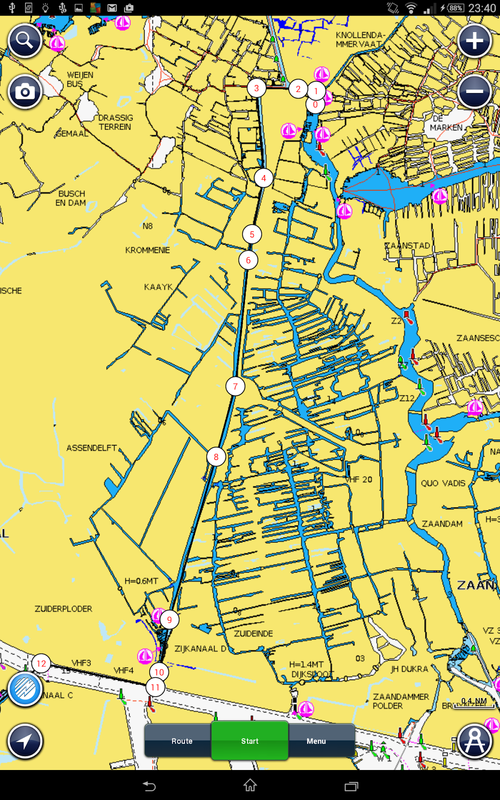 As a contingency I had plotted an alternative route last night, going south via Kagerplassen and the Oude Rijn waterways through Leiderdorp to rejoin our intended route at Avifauna. So we turn around and head for Kaarg again, now with torrential rain coming almost horizontally in the head wind. Full marks to the Gill suit, I stayed dry. The detour proves to be an attractive route (once the rain stops) but has several bridges, one of which delays us by forty minutes. The detour and additional bridge delays extend our passage time to the critical rail bridge at Gouda and we miss the 14:27 opening by ten minutes, with the next scheduled lift at 20:27! There is no option but to moor at the waiting point and then make an overnight stop at Gouda - frustrating. The Gouda bridges, this time from the north as I settle in for a six hour wait .. I am settled below having a snack when I hear the bridge warning bells sounding and come on deck to find the bridges opening for a commercial craft. A call to Barbara to get underway quickly and we both manage to tag onto the commercial boat lift and get through along with the Dutch boat shown in picture. The crew on Theodosia are having a siesta and miss the opportunity. A quick rework of the route plan shows that we should (just) be able to make the last lock/bridge openings between 19:00 and 20:00 at Algerasluis on the southern end of the Hollandse Ijssel and get into the marina at Ijsselmonde. The slog down the Hollandse Ijssel in the wind and rain seems to drag on and there are no obvious overnight stops in the event we don't make the bridge/lock openings. Sighs of relief when we reach the lock at 19:15 and I radio them to be told there is an opening at 19:20 and to standby for it. While holding for the lock opening Barbara tells me that we have a dinner invite to join Marion on East Breeze who is already in the marina, having made her way back from Enkhuizen with a crew pick up en-route. Once through the lock it is a short distance across the Noord waterway to the marina, where the manager is on the outer pontoon waiting to help us berth at 19:45. Shortly after we are enjoying the luxury of a meal aboard East Breeze, very welcome it was too. Den Oever to Den Helder, the last destination of the tour! 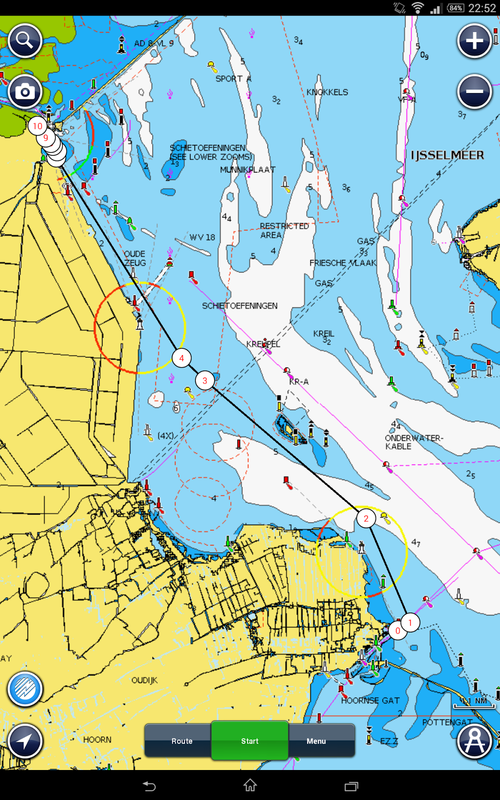 The 09:00 briefing this morning takes place on a rather windy pontoon and a race course is announced that takes us to the entrance of Den Helder via the buoyed channel leading NW from Den Oever (not a lot of choice over that part) to a mark at (8) on my route. From there the race course heads for the SE corner of Texel Island toward the west cardinal mark T-KL-B and then Den Helder harbour entrance. The race start time is 10:00 which means a flurry of activity on all boats as a more leisurely start was expected by most. The course distance is approximately 12Nm. The weather is fine but with an ENE F4-5 wind blowing, resulting in some of the larger boats having difficulty getting off the pontoons. I have my own single-hander issues as I barely have time to get the boat ready for sea and plot my course, but I do manage to get two reefs in the mainsail while still tethered to the pontoon and get away on time for the race start. I am having a good sail with Hyrst going well in the conditions, however, at the change of direction (7) the wind is fluctuating around dead astern and the autohelm not able to hold course without the risk of a gybe, so it is a case of hand steering whilst navigating and skippering (there is commercial traffic). By the time I reach point (8) with one gybe already I opt to abandon racing, bring the wind to port and have a more enjoyable private race with two other boats making the same choice. Given that Den Helder is the primary port for the Dutch Navy, as well as a major North Sea oil support harbour, I am expecting port control signals and some large traffic, however, I get a clear run into the harbour and tuck into the eastern corner for some shelter to stow sails. 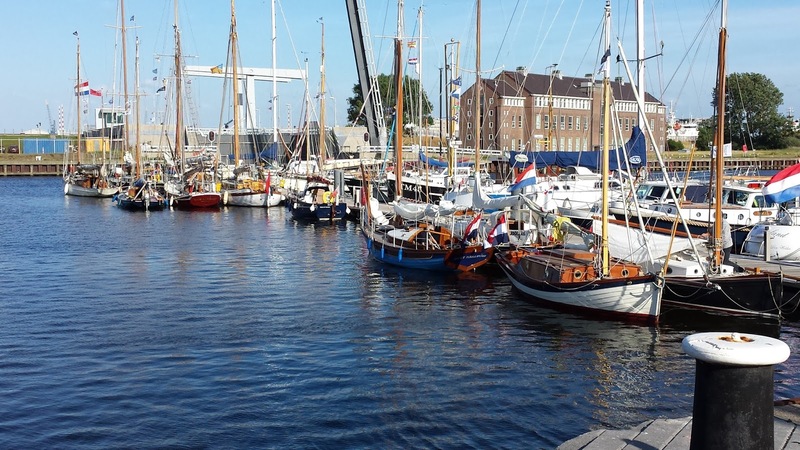 Some of the early race finishers are gathering at the Zeedoksluis ready for entry into the Willemsoord harbour, a change from our published moorings. Some confusion then ensues as the lock becomes inoperable, then it is a follow-my-leader race as we head via a further lock, Koopvaardersschutsluis (what? ), and three bridges to get to the other side of the defunct lock. As we arrive there the (repaired) lock opens and disgorges the rest of the gaffer fleet to join us! I moor Hyrst alongside at 13:30, locate the friendly Harbour Master to arrange for refuelling and pay my harbour fee of €12/night for two nights - with the wind forecast I have no intention of moving before Sunday. As we are running a day ahead of schedule today is a rest day prior to the final gathering this evening of the "OGA NL Cross Country Tour 2014". There was a suggestion of a day sail to Texel, nearest of the Frisian Islands, but the weather has scuppered that possibility - it is blowing a hooley! 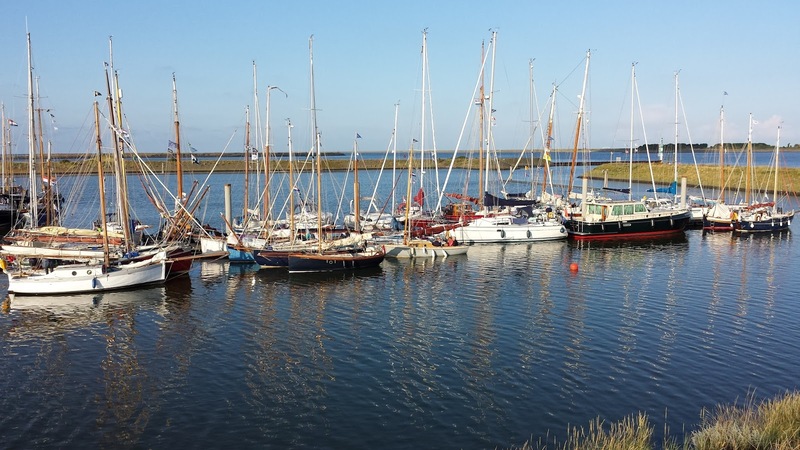 When planning the cruise I had considered spending a few extra days visiting the Frisian Islands as I am unlikely to have the opportunity to do so with my own boat again, not to be though. The hosts have also arranged for a visit to a restoration boatyard close to where we are berthed, this is associated with the "Fairtransport" emission free project. In preparation for the return journey I go about the chores of shopping, laundry, refuelling, boat maintenance and passage planning which seem to take up a large proportion of the day. The end of tour competition awards, speeches and formal goodbyes takes place in a restaurant within the restored wharehouses on the adjoining canal. Another lively event which is carried over to pontoon gatherings which last well in to the evening. The NJoy restaurant (with light colour awnings) is the location for our final gathering of the tour. The harbour is to the far side of the buildings. From discussion between skippers during the day it appears the weather has caused disruption to everyones ongoing plans. 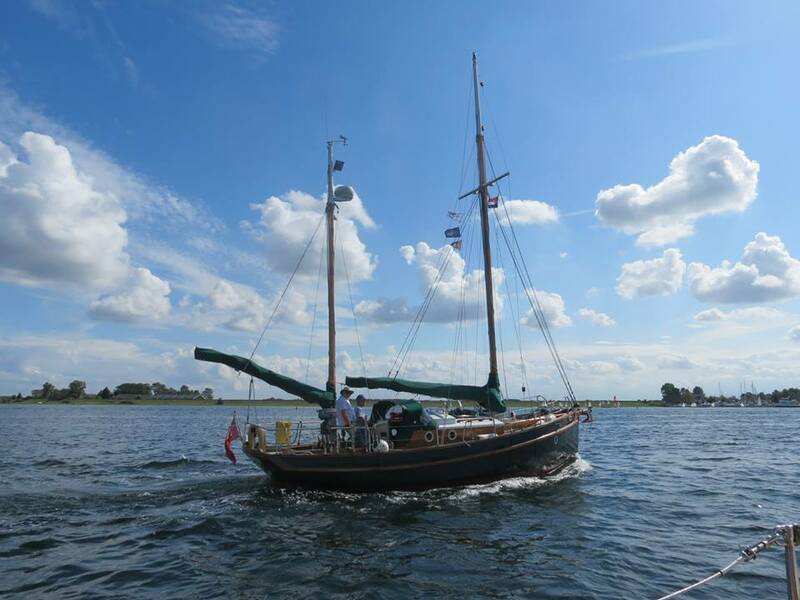 For several of the Dutch crews the intention was to cruise the local area or continue on to the Frisian Islands as part of their annual holiday. Many of the UK crews have commitments at home and had intended to make a fast return via the North Sea, which is likely to be a no go area for several days. Some have already arranged to leave their boats in Den Helder and return later for them. For others it is a case of arranging additional crew changes. For me it looks like Option 2 of my original return passage planning. According to the tour guide the intended destination for today is Workum, a Frisian town on the eastern coast of the Ijsselmeer, however, the deteriorating weather conditions and forecast strong NW wind associated with Hurricane Bertha make this unwise for most of the boats, especially so for the return crossing. 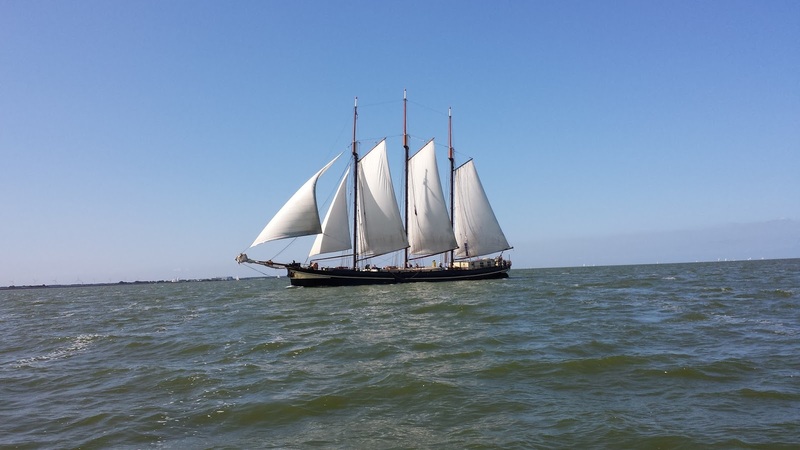 There is also the possibility that onward passage to Den Helder will be at risk later so the organisers arrange for the fleet to go to Den Oever today. In order to avoid being weather bound some of the UK boats had already opted to turn back and today was a go/no-go decision day for other skippers, with a further three or four opting to begin their return jouneys. The crew of "Susan J", having managed to get this far without any ahead engine drive, will remain in Enkhuizen for gearbox repairs. I have no crew or time constraints to consider so choose to continue on to the tours final destination. 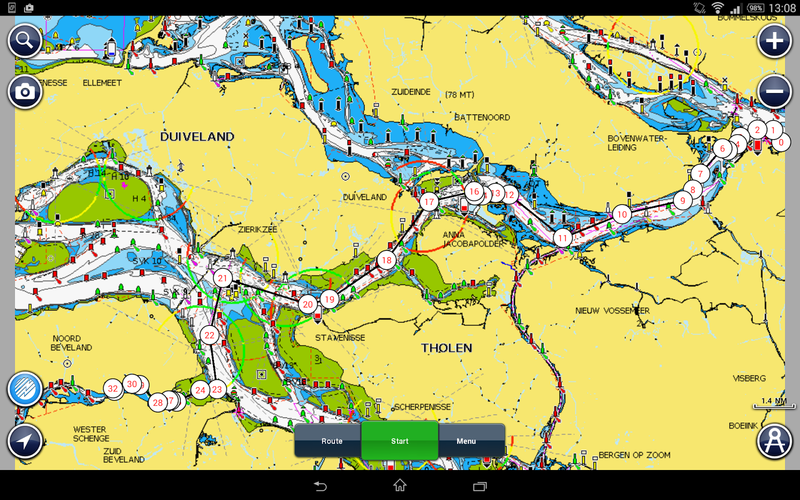 The passage distance to Den Oever is 18Nm following the western coastline of the Ijsselmeer to the Stevinsluis (7-9) where we pass through the Afsluitdijk into the tidal Waddenzee and then directly into the Waddenhaven at Den Oever (10). 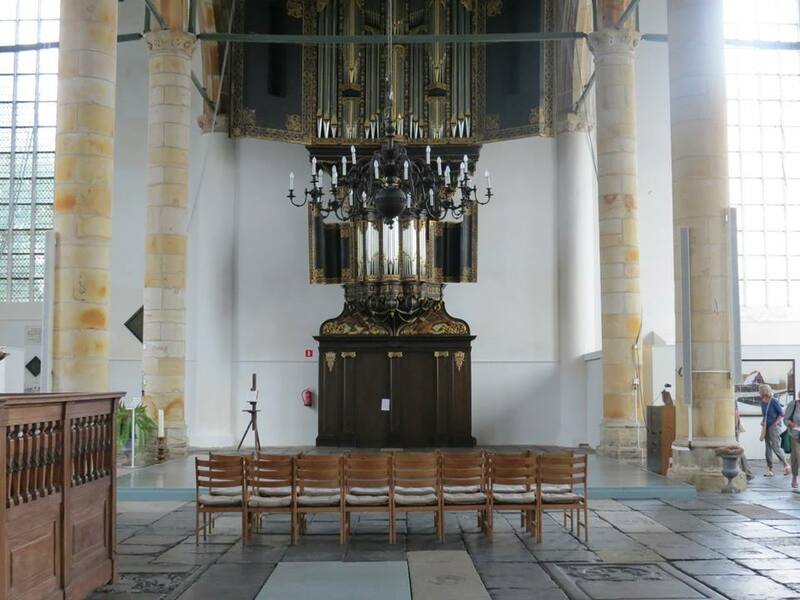 The morning briefing is held at the church in the old town, with one of the Dutch members playing a selection of traditional and modern music on the organ while we have coffee and biscuits and for many a few moments of quiet thought. The church was an unusual but equally appropriate venue for our morning briefing, I understand it is historically a "seamans church". The recital on the organ was a bonus for me as I am a fan of organ music. There is no "formal" race today but a suggestion that we make good progress to Den Oever. I exit the harbour on the 11:00 bridge opening and set sail, but with the wind light and variable/NNW we make a SOG of only 1 to 2 knots. By 12:30 we have only got as far as the De Kruepel island, which I have chosen to pass to the west of, and get headed by the wind so choose to motor. Then follows a period of alternate sailing and motoring as I chase what wind there is. Once clear of the island I have a usable breeze and manage to sail until 15:00. Boats that passed to the east of the island seem to have faired better for wind. The wind begins to freshen by the time we get to Den Oever, but passage through the lock and into the Waddenhaven is straightforward, although there are not that many alongside berths available and I raft alongside Elisabeth & Erik on Sven III again. I had to give way to this somewhat larger gaffer but passed close enough for a good look and an acknowledgement. There is a distinct change in the scenery and appearance of the waters in this area, with an open and exposed look compared to the previous few days. The character of the harbour also reflects this as witnessed in the working fishing boats of the North Sea moored in the adjoining harbour basin. There are no further barriers between us and the North Sea. 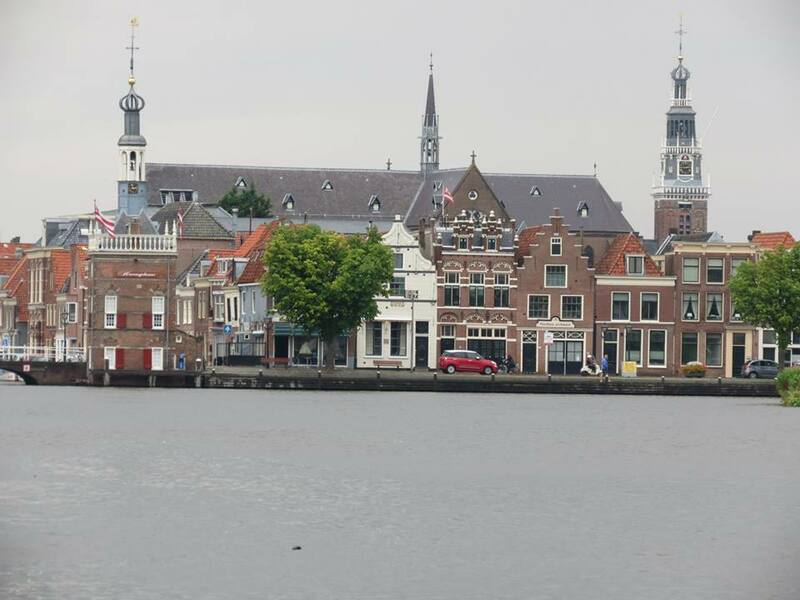 Haarlem to Amsterdam, with some "Drama & Pride"